Maria Sharapova's wildcard entry to April's Porsche Grand Prix is "disrespectful" to other players, ex-number one Caroline Wozniacki says. The Stuttgart event starts two days before the Russian's 15-month doping ban ends and she will not be allowed to attend until the day of her match. "Obviously rules are twisted and turned in favour of who wants to do what," Dane Wozniacki, 26, said. Sharapova, whose main sponsor is Porsche, has won the event three times. "I think everyone deserves a second chance... but at the same time, I feel like when a player is banned for drugs, I think that someone should start from the bottom and fight their way back," world number 14 Wozniacki said. Five-times Grand Slam winner Sharapova will return to tennis on 26 April without a ranking after serving her suspension for testing positive for meldonium. The 29-year-old was given a two-year ban in March 2016 but her suspension was then reduced in October following an appeal. She has also been given wildcards for May's tournaments in Madrid and Rome. 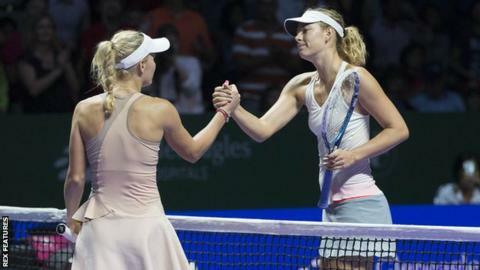 Wozniacki said Sharapova should not be allowed to compete at Stuttgart because she is still banned when it begins on 24 April. "I think it's very questionable allowing - no matter who it is - a player that is still banned to play a tournament that week," she said. "From the tournament side, it's disrespectful to the other players and the WTA." Wozniaki was speaking after a 6-3 6-0 win over Polish qualifier Magda Linette in the second round of the BNP Paribas Open at Indian Wells. The Dane's comments echo those of men's world number one Andy Murray who said wildcards should not be given to players returning from doping bans. Earlier this week, US Open champion Angelique Kerber said it was "a little bit strange for the other players that somebody can just walk on site Wednesday and play Wednesday". However, Romanian world number four Simona Halep thinks Sharapova's past achievements justify the wildcards. "She was number one in the world and won Grand Slam titles," Halep, 25, said on Thursday. "But even without wildcards she could come back easily. Her return is good for tennis."